A Lamp is a lamp…. Posted March 29, 2011 by Norburn Lighting and Bath Centre & filed under Decorative Lighting Fixtures, Portable Lamps, Tips and Advice . 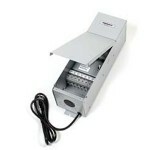 Portable lamps are those familiar fixtures we see in living rooms, family rooms, offices and hotel suites. When properly utilized, portable lamps can be the lighting solution for bedrooms, dining rooms, or foyers, and are ideal for use on a side table next to a sofa. A torchiere lamp is a great alternative to ceiling fixtures when you want to add more light to a room but prefer softer lighting. A well chosen table lamp will provide just the right light level while complementing your personal decorating style. Portable lamps are available in a nearly limitless number of options, yet all too often little consideration is given to lighting design. Table lamps are probably the most overused lighting source used in residences. People expect a lamp to perform too many functions at once; decorative, accent, task and general lighting. The usual scenario is a sea of lampshades that draws the eyes attention away from everything except the lampshade. When designing a room is the linen lamp shade really the first thing you want people to see, or do you want them to see the fantastic art, photographs, sumptuous room colors or furniture you have selected. Remember the eye is naturally drawn to light and glare. Table and floor lamps work well when they are selected with care. A lamp with a translucent shade (linen, rice paper, silk, etc) works best as a decorative light source. Using a 25 watt incandescent ( 5 Watt CFL) they will create little islands of light that draw people to seating areas and add scale and comfort to a room. For reading, choose a fixture with an opaque liner or perforated metal lid. The illumination is directed downward onto the table or across one’s lap. One of the most important things to consider when deciding on a table lamp is the height at which the shade will sit once placed on a table. The lamp’s bulb and socket should not be visible. The glare from a visible bulb will interfere detract from the beauty of your table lamp. If you are planning to use the lamp for reading, take measurements to be sure the lamp will be tall enough to cast its light over your shoulder. The bottom of the shade should be about even with your cheekbone when you are sitting. Remember that a shade with a wider lower brim will cast more light on the surrounding area below it and better facilitate reading. A narrower brim will cast less direct light. Table lamps should satisfy lighting requirements as well as complement décor. Be sure to find out what a lamp’s maximum wattage is before you purchase. Never use a higher wattage bulb than specified on your lamp. Be sure to consider the functional as well as decorative features of the type of shade you choose, too. A white or off-white fabric shade will be translucent allow high light output. A darker or opaque shade will limit the light output and is useful when you want to create a more subtle lighting effect. A darker, non-translucent lampshade with silver or gold lining will create a pleasant glow around the room. If you love the freedom to easily change the light level around you, consider getting a table lamp that accommodates 3 way bulbs. For even more lighting flexibility, a lamp with a built-in dimmer switch will offer a range of lighting levels for any occasion whatever the time of day. Energy-saving compact fluorescent light bulbs can be substituted for standard incandescent bulbs in most table lamps. They have a longer life, and they use considerably less energy than their incandescent counterparts. Keep in mind that only dimmable compact fluorescent bulbs should be used in lamps with incandescent dimmer switches. 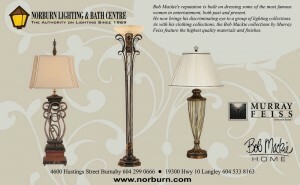 Posted March 28, 2011 by Norburn Lighting and Bath Centre & filed under CFL, Energy Saving, Green Living, In The News, Tips and Advice . By now, pretty much everyone has heard about compact fluorescent lights (CFLs). Consuming roughly 30 percent of the power required for a similar incandescent bulb, CFLs are a no-brainer way to reduce home energy bills and slash greenhouse gas emissions. Unfortunately allot of incorrect, outdated information has given CFLs a bad rap. 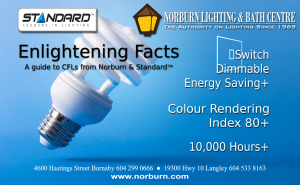 Norburn Lighting has put together a quick guide to help dispel some of the misinformation that is swirling around CFLs. Myth 1: Fluorescent lights flicker. Quality CFLs, with their electronic ballasts, do not flicker. Myth 2: Fluorescent lights are slow to start. While CFLs don’t start at full intensity like incandescent bulbs, nearly all CFLs turn on (without flicker) instantly and reach full illumination very quickly. CFL’s manufactured by reputable suppliers such as Standard™ Lighting come on instantly at close to full illumination. Only the flood light styles start at noticeably less than full illumination, but within 20 to 30 seconds they are at over 80% illumination. Interestingly, we’ve come to prefer softer initial illumination when using these type of bulbs. When we enter a room the slightly softer initial illumination is more welcoming, and the CFL is easily at full illumination by the time we begin any light-dependent tasks. Myth 3: Fluorescent lights are always cold-feeling and remind us of office lighting. Myth 4: Fluorescent lights won’t fit in my fixtures, candelabra, three way or recessed lights and cannot be dimmed. A CFL is often not an exact size substitute for an existing incandescent bulb, but a far greater range of sizes is available than is generally realized. At Norburn we stock a large variety of standard, globe, flood, candelabra, three-way and yes dimmable CFL’s. You get what you pay for. CFLs are not all created equal, and the no-name bargain units sold at big box stores, dollar stores and furniture giants are cheap for a reason. The difference is usually in the quality of the ballast — the bulky part between the CFL’s light tube and the screw base. Junky ballasts can mean flicker, buzz, and a short service life. Choose a quality brand like Standard™ Lighting CFL’s. One of the biggest complaints made by new CFL users is that the light “looks dingy.” How could this be, given that CFLs produce the same amount of lumens (light energy) as their incandescent equivalents? When under a lamp shade, less light travels down to your task; for instance when you are reading or knitting. More lumens go up from the shade. Suppose you’re accustomed to 100-watt incandescent bulb in that table lamp by the couch. A traditional bulb of this type produces about 1200 lumens. CFLs of 20 watts will do the same. But there’s a catch: the lamp fixture is designed for a traditional bulb. CFLs and incandescent lamps lumens radiate differently. So while they’re producing an equal number of lumens, the CFL may not be delivering the same amount of light to a given workspace. In some cases, it might be a better idea to replace a 100-watt incandescent with a 23 watt CFL that’s roughly equivalent to a traditional 125-watt bulb (about 1600 lumens). You’ll take a 3-watt penalty, but that beats squinting at the newspaper. Screws in CFLs are what we like to call a “transitional technology.” These bulbs contain their own ballasts, and are intended to screw into the same sort of light fixtures we’ve been using for over 120 years. As we’ve seen, this arrangement is something of a compromise. Light fixtures designed for CFLs take into consideration their particular illuminating properties. They also have their own ballasts, which mean the bulbs can be much simpler. They plug into their fixtures with a two- or four-pronged base. Pronged CFL bulbs won’t work in incandescent fixtures, but their simplicity will eventually make them much cheaper and easier to recycle than screw-in CFLs. You might not have the luxury of replacing your ceiling-mounted fixtures, but keep an eye out for CFL-specific table and desk lamps. When it makes sense, retire incandescent fixtures and enjoy the improved efficiency of true CFL lighting. CFLs require a tiny amount of mercury to function. Mercury is poisonous, and since it tends to accumulate in the human body, there’s no acceptable level of exposure. An intact CFL will never emit mercury. But CFLs can be broken through accident or improper disposal. That makes it important to dispose of spent or damaged CFLs in a responsible manner. There’s no need to panic if you break a CFL. Most bulbs are damaged when they’re cold, and the mercury is likely to adhere to the bulb’s debris. To be safe, ventilate the area. Using rubber or latex cloves — the kitchen variety should be fine — carefully gather up the ballast and broken glass with disposable paper towels. Wipe the floor carefully with more paper towelling and then double bag everything in Ziploc bags. Dispose as hazardous waste. As a point of interest, CFLs can actually reduce the amount of mercury released each year into the environment. While most of B.C.’s power comes from hydro, we often must buy extra power to meet winter loads and this power may come from coal. Coal-fired power plants release the elemental mercury that naturally exists in coal into the air when coal is burned to make electricity. Because of its superior efficiency, a CFL is actually responsible for putting less mercury into the wild than its incandescent equivalent. 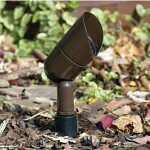 Posted March 23, 2011 by Norburn Lighting and Bath Centre & filed under Landscape Lighting, Outdoor Fixtures, Tips and Advice . unique and aesthetically pleasing dynamic to any yard, garden, patio, walking path, or common area. Norburn is your source for the landscape lighting products to bring these spaces to life after the sun goes down, providing unmatched quality and an aesthetic effect while adding safety and usability. Designing and installing a low voltage landscape lighting system looks easy… buy some lights, some wire, a transformer and hook them up. Unfortunately this can be recipe for disappointment – you likely won’t be happy with the final performance of the system. In addition to diminished bulb life, a poorly planned installation will suffer the effects of the Pacific Northwest coastal climate resulting in fixtures and sockets corroding and the entire installation failing. A well planned landscape lighting installation will work properly and last 15 or 20 years. The design of a landscape lighting system is part art and part science. It’s about understanding how much light is needed and determining what the focal points will be. The choice of fixture, bulb wattage, beam spread, placement position and angle for each and every light source are a critical to the performance and success of the system. The correct location of the transformers and wiring routes are vital to ensure every fixture has a bright white bulb that will last its rated life. There is currently is a wide variety of landscape lighting components available to consumers. The materials used and levels of quality vary considerably and the differences can significantly affect your systems long term operation and viability. Be sure you choose components that are built to last, not those that are built to a price. Landscape lighting fixtures today are made from a wide variety of materials including plastic, aluminum, copper, stainless steel or brass. Plastic is used in the lowest cost multi-pack systems; aluminum is the most popular material today. Not all aluminum fixtures are created equally. Lower cost fixtures are made from aluminum alloys that contain other metal to keep the cost of the material down. This, however, makes it more difficult for the paint to stick to the surface of the fixture resulting in premature paint peeling and chipping, which then allows the soil to corrode the unprotected aluminum itself. Better quality aluminum fixtures are made from higher quality marine-grade aluminum to eliminate the paint adhesion problem. Many higher quality fixtures are made from natural copper, brass or stainless steel. As with aluminum there is a wide range of quality to be found. The paint on lower cost fixtures is simply sprayed onto the fixture and can easily be chipped or scratched. Higher quality fixtures use an electrostatic powder-coating process which is then baked onto the fixture in an oven. This process produces a significantly more durable finish that is practically chip and scratch proof. When fixtures are pointed upwards to illuminate trees they are prone to water build-up on the lens. It is therefore important to choose fixtures that do not allow any water to become trapped on the lens or leak though to the bulb and socket housing. Look for double gaskets on the fixture shroud. What about solar powered light fixtures? overcast days will not allow the batteries to charge enough to power the units for the night. A Low Voltage Lighting System from Norburn offers the greatest versatility with hundreds of fixture combination’s for every landscape lighting application. For over 40 years Norburn has provided the broadest selection of quality products and superior service to help navigate the choices to ensure you get what you need. When you shop at Norburn you can rest assured it will be done right. Posted March 18, 2011 by Norburn Lighting and Bath Centre & filed under CFL, Energy Saving, In The News, LED, Regulation And Bylaws . Incandescent bulbs will be around for a long time regardless of recent legislation by government that prohibits the sale of certain types. The vast majority of incandescent bulbs will not be impacted by this legislation. The obvious and most common bulbs that are affected are the 75 watt and 100-watt bulbs in various shapes. The fact is that many of these bulbs will be replaced with energy saving alternatives like halogen. You do not necessarily have to choose a Compact Fluorescent or LED. As much as there has been a lot of talk in the past about these legislative changes, it still has come as a shock to the general population as can be witnessed in British Columbia where rules have gone into effect in January 2011. People are confused and upset at the notion that they can no longer buy what they have always bought and are comfortable with. There has been a lot of bad press (much of it not warranted) about the CFL and the generally misunderstood LED bulb. The idea to legislate inefficient products is a great one, and we fully support it as long as the alternative products are readily available, provide similar light quality and performance, and sell at a reasonable price. 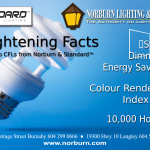 Norburn www.norburnlightingandbath.com is one of the most recognized names for lighting education and a top lamp distributor in the Canadian market and we have been hard at work sourcing energy saving alternatives to incandescent. We are excited by the products we have to offer to date primarily in the halogen and LED category. There are many incandescent bulbs for which the only alternative is to change the shape or reduce the wattage to something accepted by law (i.e. drop from 60-watt to 40-watt). Virtually all incandescent bulbs are dimmable while most CFL & LED lamps are not and even if they claim they are, they do not dim as nicely as an incandescent bulb. The legislation does not ban incandescent technology; it sets minimum efficiency requirements for lamps. Many halogen incandescent lamps are available today that pass EISA. – What is the necessary wattage to replace your existing incandescent bulb? – What is the color quality? There is a scale that ranges up to 100 and the higher the score the better the light quality. Incandescent scores 100 so you want to be as close to that as possible. Most alternatives run in the 80 – 95 CRI (Color Rendering Index) range. – What is the life rating of the bulb? – Can they be installed outside? – Will they work with a motion sensor or photocell (lights turn on when it is dark automatically)? – Is the bulb approved by Energy Star? This may be important because your local electric utility maybe offering an incentive (i.e. mail in rebate) for CFL & LED alternatives and in most cases, the bulb must be Energy Star approved. Above are key questions that will help you in making the right chose when purchasing your next bulb. 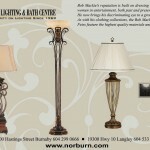 Posted March 14, 2011 by Norburn Lighting and Bath Centre & filed under Bathtubs, Kitchen & Bath Plumbing, New Products, Trends . Soaking in a bathtub offers a sense of well being, relieves aching muscles, calms the mind and nourishes the spirit. Indulge all of these therapeutic benefits in any of the four free-standing bathtubs from the aquabagno collection. This is the shape of things to come. The Aquabagno line of freestanding baths introduces a premium man-made Stone construction that allows for new geometries, textures and designs for the modern bath. The Aquabagno line offers the beauty of real stone yet is warm and comfortable against the body. And it’s easy to clean. Aquabagno bathtubs will be the focal point of any bathroom.